HealthAid Acidophilus Plus are formulated using special strains of Lactobacillus and Bifidobacterium from a dairy-free medium. Fructo-Oligosaccharides are added to help support the growth and proliferation of bacterial strains in the intestinal tract. 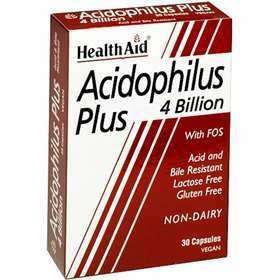 Health Aid Acidophilus Plus 4 billion helps support a balanced intestinal flora, to maintain good digestion and support healthy immune function. Children 1-12 years of age, one capsule daily. Capsule powder can be emptied and mixed with food and drink. Adults and children over 12 years of age, one or two capsules daily. Capsule Shell propyl methyl cellulose (HPMC), Bulking Agent (potato maltodextrin), Fructo-Oligosaccharides (FOS), Culture Blend, Anti-caking agent (magnesium stearate, silicon dioxide).